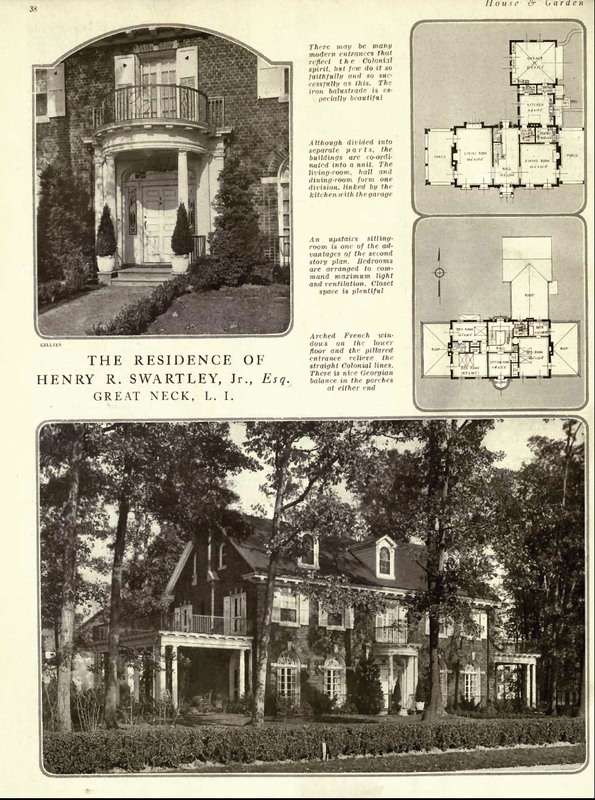 The residence of Henry Ruth Swartley Jr. located in Kensington in Great Neck. Swartley was president of the Long Island Association from 1933 to 1941 (previously the Long Island Chamber of Commerce). He had previously worked at the Union Carbide Corp. and later Atlantic Cement Products in Hicksville. Swartley was also a five term mayor of Kensington and a member of Nassau County's planning commission. He died in 1958 at the age of 79. I am not sure of the exact location of the house. as you know, i'm from out of town but it looks to me like many houses in kensington were built with a basic formula and this house is one of them. many have those two porches/porte cochere or whatever you call them and are neo-cols. there are different materials and other iterations but there seems to be a basic formula so it may be hard to spot this one.